Softweb Smart Factory is a smart production line monitoring solution powered by AI and IoT technologies, which empowers you to monitor everything on the shop floor from a centralized, live dashboard. The solution involves highly trained machine learning algorithms that can predict machine failures and brings higher operational intelligence that your legacy system was not able to perform. Our Industry 4.0 solution enables manufacturers to connect multiple production lines and machines, acquire data at different stages of production from several disparate sources, and develop capabilities like remote monitoring, edge analytics, and predictive maintenance, and digital twin. Are you ready to take your first step towards Industry 4.0? How long would it take to implement the Smart Factory Solution? It depends on the readiness of your infrastructure and the business use case. However, if you are already collecting and storing data in any way, it would not take much time for set up and installation. In case you have any specific customization requirements for dashboard and reports, then it may affect the timeline. I am using old machines in the factory. Can I use this IoT solution in my manufacturing unit? Yes, of course. We just need to assess your infrastructure and identify data points so that our technical team can guide you further. We will then integrate your current machines and help you make sense of your data. During the assessment, our technical team will identify machines which are smart, semi-smart, and dumb. Smart machines can be connected directly to the cloud. Semi-smart machines can provide a few data points directly to cloud and require external sensors/actuators in order to send any other data points. Dumb devices cannot provide any data and require external sensors/actuators to connect and send particular data to the cloud. My machines or assets are not connected to the Internet. Can this service still be applied on them? Yes. Our engineers will visit your facility to get a full understanding of your infrastructure and identify the solution on how to make your machines or assets IoT enabled. In case of totally dumb devices, we can always set up an internet connection using external sensors and actuators. We are already storing our data using a third-party cloud storage provider. Can we implement this solution? Yes, Smart Factory can be implemented with the existing third-party cloud service provider. In this scenario, solution will collect the data from the third-party cloud storage and store it to IoT cloud. The solution will then use the data from the IoT cloud only. Will my data be secured in the cloud? The security of your data is paramount to us. All communication is secured with SSL and TLS protocols to ensure secured device management and connectivity management. Solution uses OAuth2 authentication which will enable third-party applications to access the user accounts on an HTTP service. What is the pricing model? How much does it take to implement Smart Factory? I have couple of factories situated at different locations. Is it possible to monitor all of them from a single solution? Yes. The solution allows user to add multiple factories situated at different locations. Each factory can be divided into particular floors, production lines, stages/processes. Users can always view the generic dashboard along with the combined KPI values or the individual KPI values for each factory. We can customize the dashboard/reports as per your requirements. Not sure how to get started with Smart Factory? 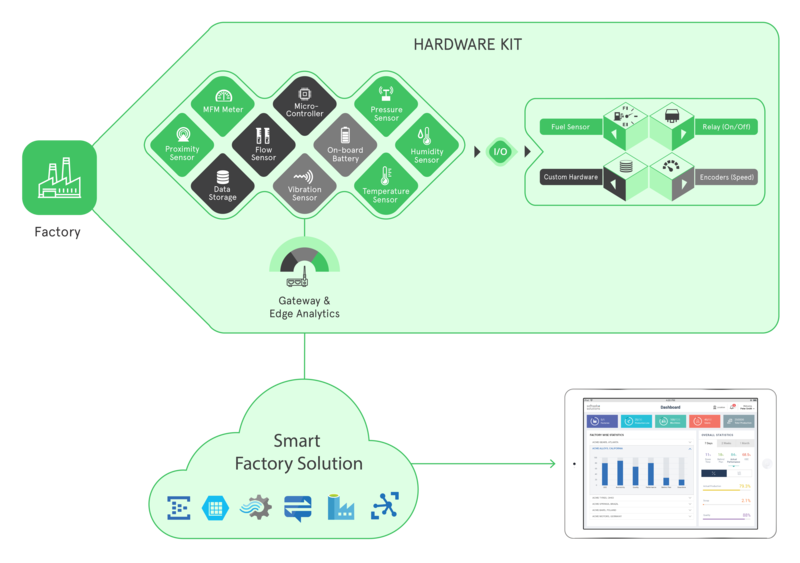 Our team can walk you through the Smart Factory demo to help you realize how IoT can digitize your business process and create opportunities of increased factory productivity, leading you towards Smart Manufacturing.